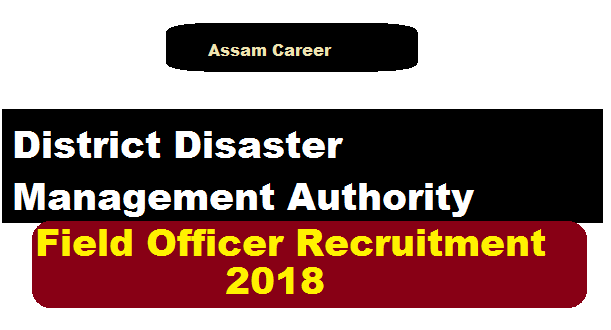 DDMA Goalpara District Disaster Management Authority Recruitment 2018 : The Disaster Management Authority DDMA Assam Goalpara has recently issued a recruitment notification in the month of June 2018. According to the Govt. letter No ASDMA.100/2017/103 dated 13th, June, 2018 from the Joint Secretary & State Project Coordinator, Assam State Disaster Management Authority, Dispur, Guwahati, Assam, applications are invited from the intending candidates for recruitment to the post of Field Officer (Disaster Management) on contractual basis to be posted at Balijana Revenue Circle and Rongjuli Revenue Circle of Goalpara District,Assam. We shall discuss more about this government Job in the following section. In this section, we will discuss in detail about Recruitment of Field Officer Under DDMA Goalpara Recruitment 2018 with all the details and requirements . Following are the details of the posts under Goalapara District Disaster Management Authority Recruitment 2018 Assam with required qualification, age limit, salary and every details. Educational Qualification: Candidates must have Bachelors’ degree in Science or with Statistics, Geography, Environmental Science or Geology as a subject, or Diploma in Civil Engineering or Agriculture from a recognized University/Institution. Other Qualification: Computer skills specially MS Word/Excel/Power point/Internet use/e-mails. Preference will be given to candidates having BCA or equivalent course on computer science. Age Limit: Applicant age Should not be below 21 years & 35 years as on 1st January, 2018, relaxable in case of SC/ST candidates as per rules. Monthly Remuneration: An amount of Rs: 20000/- will be paid as fixed consolidated monthly remuneration. Place of Duty: The person selected under DDMA Recruitment 2018 Goalapara District will be stationed in Balijana Revenue Circle & Rongjuli Revenue Circle and will work under the direct control and supervision of the Circle Officer concerned who will be the authority to sanction leave and reporting officer in respect of performance appraisal. Contract Duration : The contract will initially be for a period of One year which is subject to annual renewal on the basis of performance appraisal and as per Govt. instructions further. Candidates have to apply with standard format of application. The Last date of submission of application form in standard format (enclosed with the advertisement) along with self-attested photocopies of testimonials & 2 copies of coloured photographs of the applicant is on 2nd July, 2018. The candidates are requested to submit their application forms to Deputy Commissioners’ Office building, District Disaster Management Authority (DDMA) Cell, 2nd Floor through post or by hand.